Female backcountry skiers who don’t want to give up good downhill performance for a lightweight boot, your feet have found their match. Atomic’s Waymaker Tour 100 W is a brand new boot for fall 2013. It was designed with strong backcountry female skiers in mind and it delivers. A lightweight Pebax shell with three buckles, a lugged sole for bootpacking and touring bindings, and a walk mode with 35 degrees of forward mobility ensure this boot will get you uphill with relative ease. For the descent, you’ve got a stiff, carbon fiber spine, which gives you solid strength and power transmission through the turns. When skiing, I couldn’t even tell this was a three-buckle boot. Bonus: The boot has sixth toe stretch to make it more comfortable if you have any growths on the outside edge of your feet (like many seasoned skiers do). Lugged soles, to be used in touring bindings, provide good traction on climbs and they can be swapped for DIN-compatible alpine soles for regular bindings. Extra soles sold separately. A women’s specific Intuition liner can be custom heat-molded for the perfect fit. If you spend most of your time inbounds at resorts with the occasional tour, this boot may be too light and soft for you. 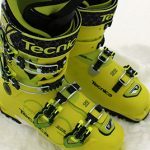 But if you’re more 60 percent backcountry, 40 percent chairlifts, the boot’s combination of lightweight and stiff might be perfect.